The Longji rice terraces, more popularly known as the ‘Dragon’s Backbone’ because of the way the terraces resemble dragon scales, are a few hour’s drive from Guilin. Since our flight back to Shanghai wasn’t scheduled to depart until 9:45 pm, we decided to squeeze in a trip to see them before we left. We hired a driver for the day, and for the first time all trip it turned out to be a woman. I have to say, she was the craziest lady we’ve encountered out here – perhaps with the exception of the two grandmother-age women we witnessed literally having a fistfight in front of Mao’s tomb…but that’s a story for another time. She giggled at nothing, honked at everything on the road, and kept pointing out the houses (perhaps the only English word she knew how to say?) I’ll give her this though, she got us to the bottom of that mountain in less than 3 hours, and it was supposed to be a 4 hour drive. Another day that was hot as hell and we were at the bottom of this huge mountain. We originally thought you could drive all the way to the top, but apparently you can’t. 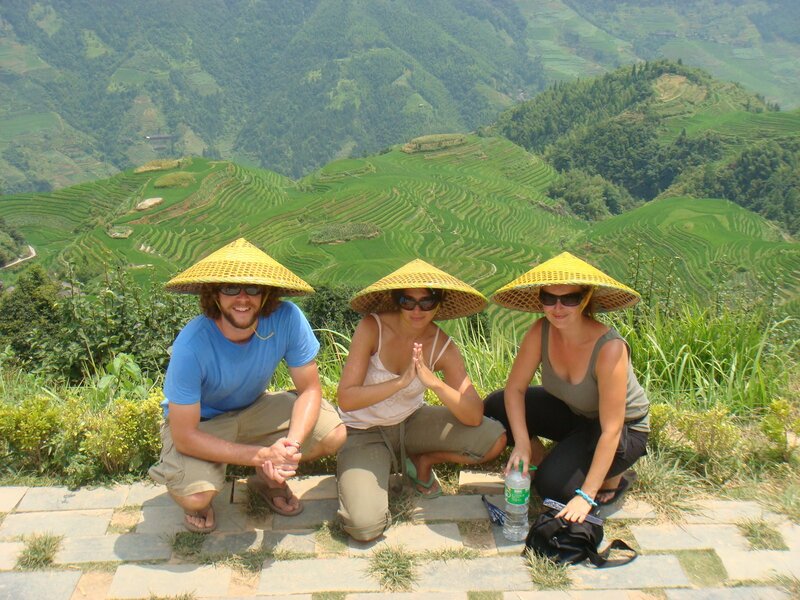 We bravely donned our rice paddy hats, specially bought for the occasion (don’t laugh, those things are a LIFESAVER. There is a reason the locals wear them in the fields and it’s because they create a massive amount of shade when the sun is beating down upon you) and started to climb. Remember how I said there were stairs everywhere…yeah, someone should count how many there are to the top of this mountain because it might be in the millions. We were nearly as sweaty as when we were biking through the hills. It was so completely worth it though, the views are nothing less than stunning. There was a little village along the way where the Yao people live and you can stop for a cold drink and a little rest. The Yao women are pretty interesting, they have this super long hair that they don’t cut because of their spiritual beliefs, and they manage to bundle it all up into the huge masses atop their heads. There weren’t very many people up top so we were able to relax and just enjoy the fact that we finally made it to the top of the mountain. 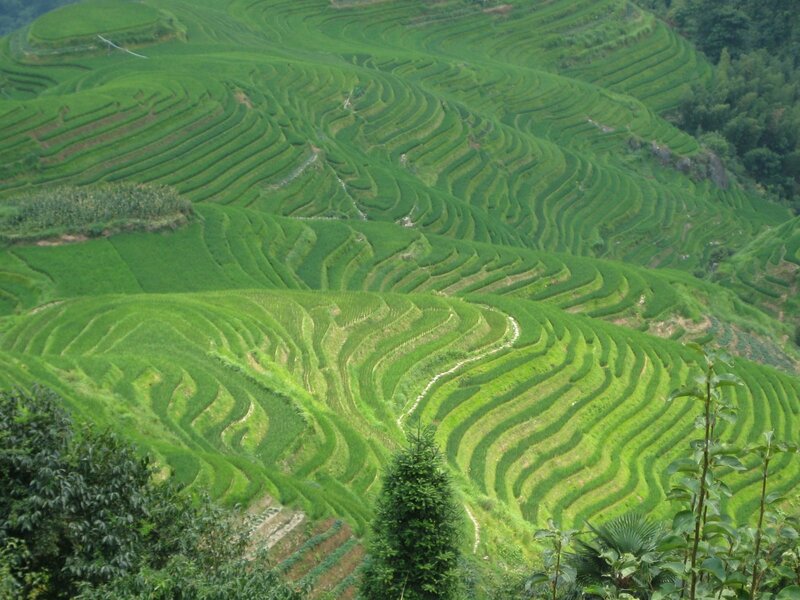 The whole mountain has been covered in terraces so as to produce as much rice as possible. It’s a brilliant shade of green at this time of the year because the rice is about 6 inches tall and if there’s a breeze it looks like oceans of grass. We bought some books with pictures of it in all seasons, it’s one of the places I’ll definitely come back to if I can. We made it to the top! Hurrah! Unfortunatly we only had a few hours and it was time to head back to Guilin for our flight, but next time I’ll plan ahead and stay overnight in the village so I can explore the area a little more.